The Ryearch team has just moved into their brand new office at Langage Business Park, built by their in-house groundworks and construction workforce over the past 12 months. The new build office is the last in a cluster of five office and industrial units on the Sandy Court section of Langage Business Park, with all units built and developed by Ryearch since they purchased the land in 2008. This last block – worth around £1.1 million – is a two storey construction covering some 6,000 sq, with the Ryearch team taking the upper floor and the ground floor available for rent. The interior features a serpentine staircase, office pods, training/conference room, external balcony room, break out areas, fully equipped kitchen and shower/WC facilities. There is ample parking for the office team and visitors, and allocated space for secure data storage (hard copy and electronic files). High-end fittings and fixtures were used throughout, complimenting the modern design of the building, and the space and light inside. Of the four previously completed buildings two have been sold to accountants Mark Holt and Co and holiday firm Blue O Two – and the other two are let to accountants HM Williams and independent banker Balance for Business. 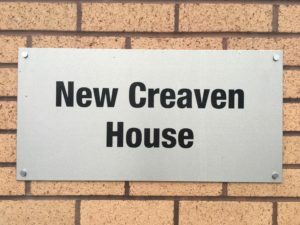 The new head office has been called ‘New Creaven House’ in recognition of the family behind the firm, who established Ryearch nearly 30 years ago. The team has not strayed far from their previous HQ which was also in Plympton, although this new site is on the eastern side near the A38 Devon Expressway, and thus enabling easy access routes into and out of Plymouth. Further details about the whole Sandy Court development can be found here. Ryearch’s new address details and directions are here.